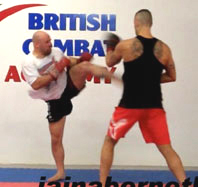 This video shows a bunkai drill for moves 3 to 6 of Pinan Nidan / Heian Shodan. It was filmed at a private training session in August 2011 and we had just been looking at applications for the previous turn. This clip joins that session as we look at the “lower-block” posture and onwards. At this class we did some three-person conditioning drills. The way these work is that one person holds the pads, one person hits those pads, and the third person makes it as difficult as possible for the striker by pulling them at various angles with a belt; or pushing them backward for a given time. This short video was filmed at a class in July 2011. It looks at an application for the sequences immediately following the first “spear hand” strike in Kushanku (Kanku-Dai). This video was filmed in July 2011 at Marc and Dianna MacYoung’s annual Animal List BBQ in Colorado, USA. 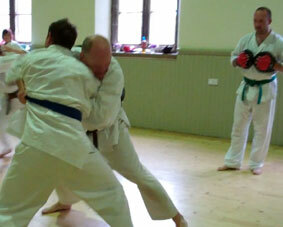 I taught for a couple of hours on the Saturday where I covered general kata principles. This clip shows a little of our discussion on angles in kata and why things are in threes. 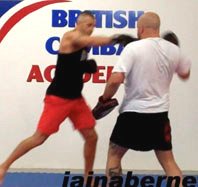 Here is the second part of the three part technical pad drill. If you’ve not yet seen Part 1 you should watch that first. You can view it by clicking HERE. This video is on the first of the nine throws Gichin Funakoshi shows in Karate-Do Kyohan. The name Funakoshi gives to the throw is “Byobuaoshi”; which translates as “folding screen topple” or “to topple a folding screen”. 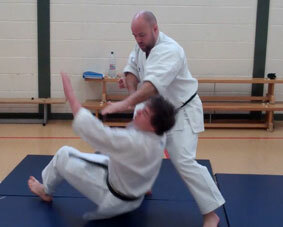 In the wider world of martial arts, the throw is more commonly known as “Osotogari” or “major outer reaping throw”.